Blog post Methane release in the Arctic could spell disaster? Methane release in the Arctic could spell disaster? There are billions of tons of methane gas in the arctic circle. The gas is trapped inside permafrost, the layer of land that remains frozen throughout the year, and inside clathrates, which are physical compounds of methane trapped inside an ice crystal structure. Clathrates are found at the bottom of the sea, the temperature and pressure there keep them stable. The picture above shows methane bubbles trapped in ice at Abraham Lake in Canada. There’s not much snowfall at this lake and that’s why we can see the bare icy surface. The release of methane is not unique to it though, it is a natural process. However, this process can be accelerated by global warming as methane clathrates are only stable within a particular range of temperatures and permafrost would not be frozen all year round anymore. The big issue is that methane is 25 times more powerful as a greenhouse gas than carbon dioxide and that this methane release would cause a positive feedback loop. The more methane is released, the more the planet warms. The more the planet warms, the more methane clathrates and permafrost are affected and more methane is released, worsening the situation. Not to mention that a reduction of ice at the poles would reduce the earth’s albedo: its reflectiveness. White shiny ice covered in snow is replaced by the dark ocean, less of the sun ray’s are reflected away (and more are absorbed), and temperature increases. 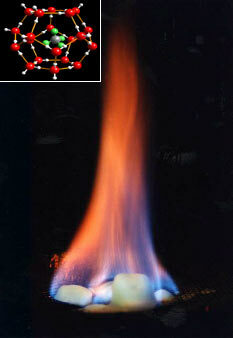 In fact, methane is considered to be 25 times worse than carbon dioxide when taking into account a 100 year period. It only survives in the atmosphere for 8.4 years on average and during a 20 year period it has 72 times the global warming potential of carbon dioxide. Methane has a strong, immediate effect on global temperatures while carbon dioxide has a weak effect that lasts far far longer, over 100 years. It’s easy to paint a doomsday scenario, especially if we look at the estimated amount of methane present (around 1400 gigatonnes). If it were all to escape quickly it would definitely mess up our climate very very quickly. Shakhova et al. (2008) estimated that there could be a sudden release of methane of the order of 50 megatons. This would increase the amount of methane in the atmosphere by a factor of twelve. However, the probable timescale for the release is still quite large. Fifty-five million years ago there was a sudden release of methane in the atmosphere, probably due to the breakdown of methyl clathrate, but the process lasted thousands of years, not a couple of decades. There are many steps to the methane release process. For example, the methane at the bottom of the sea has to go through it to get into the atmosphere and a lot of it is converted into carbon dioxide, which is still a greenhouse gas, but doesn’t have the same short term impact as methane (though it does make the oceans more acidic). Methane release in the arctic will definitely accelerate the process of global warming and we should do all we can to figure out how to minimise its impact, but a sudden catastrophe is unlikely. Are expensive cosmetics worth it?